Here is a recent (Jan 2012) full page colour advertisement in our only local daily newspaper. The aim of this advertisement was to attract potential depositor to opening a Fixed Deposit Account. It show that the bank is giving out a Guaranteed Minimum Interest of 6.18% on Structured Deposits. 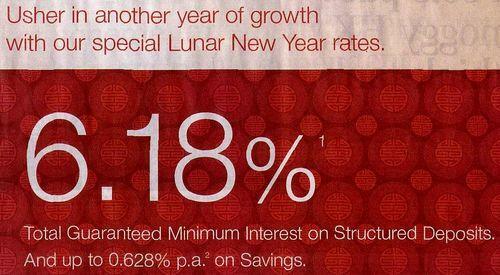 Reader will instinctively think that they get 6.18% annual interest from the bank. Especially with the second line showing "0.628% p.a. on Savings". If you read their fine print... "You receive yearly payout plus minimum Maturity Variable Interest totaling 6.18% of the Principal Amount over 5 years and 11 months (equivalent to an effective interest rate of 1.0512% a year)." So it is not 6.18% p.a. but 1.0512% p.a. of interest. The also state somewhere that "keeping your principal guaranteed when held to maturity." Which meant that you may be penalised for early withdrawal. So even the 1.0512% p.a. interest is not entirely assured. Again on their fine print, it stated that "...structured deposit are not fixed deposit... structured deposit entails certain risks, including potential loss of the principal sum invested if the investment is not held to maturity." So be aware of your contractual obligation.